This month's board is very simple. It will probably be the last board I will have up for the year; unless May gets slow HA, HA, HA! I decided to make it a board full of flowers. 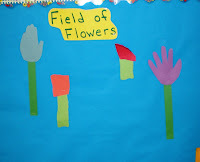 I titled the board "Field of Flowers." I have an envelope full of green scrap paper, and another envelope full of different colored scrap paper. There are scissors and glue sitting on top of the board area. 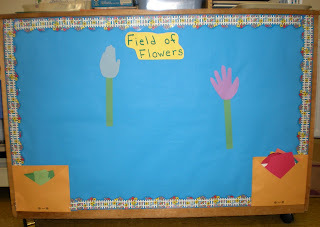 The children can take some paper, scissors, and glue to the table and make some flowers, then we can staple them to the board to fill it with a wonderful floral creation. 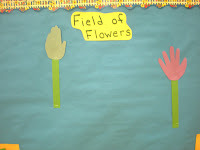 I made the first two flowers using one of the children's hands. I traced one open hand and one closed hand. It will be interesting to see what the children come up with. I'm going to use this idea in my Sunday School room. I'll match it up with a verse or something. It'll be cute! Family fun has the most adorable hand lily in this months issue! Do you have this magazine? If not, you could probably find it online. You trace the child's hand on white paper and roll the fingers back with a pencil. It is wrapped around yellow pipe-cleaners in the middle. I might be trying this with the girls. There is the parable of the lily that can be read with this craft. Okay- rambled on and on. You know me- can't help but share!! Have a good day!! Need to get off of computer and work on planning peanut's birthday party! !